What is the cause of AERD/Samter’s Triad? The cause of AERD/Samter’s Triad is not well understood, although extensive research is underway to learn more. AERD is not a genetic or inherited disorder. People with AERD/Samter’s Triad often have high levels of cells called eosinophils in their blood and in their sinuses, which may lead to chronic inflammation of the airways. It has also been found that people with AERD/Samter’s Triad have an impaired cyclooxygenase enzyme (COX) pathway, and produce high levels of leukotrienes. Leukotriene levels are further increased after ingestion of aspirin or NSAIDS, which is why patients develop reactions to these medications, and why anti-leukotriene medications are sometimes helpful as treatments. What are the treatments available for AERD/Samter’s Triad? People with AERD/Samter’s Triad who have not been desensitized to aspirin should avoid using aspirin or any other NSAIDs that inhibit the COX-1 enzyme. Acetaminophen (Tylenol) is usually well-tolerated at low does (below 1000 mg) and may be used as an alternative pain-killer, though some patients do experience mild reactions if they take acetaminophen at higher doses. Medications that only inhibit the COX-2 enzyme (in the United States celecoxib or Celebrex is the only available COX-2 inhibitor) are safe for patients with AERD/Samter’s Triad to use. Although complete avoidance of aspirin and NSAIDs is important, even in the absence of these medications, these patients continue to have symptoms of asthma, nasal congestion and sinusitis, and growth of polyps in the nose, called “nasal polyps”. 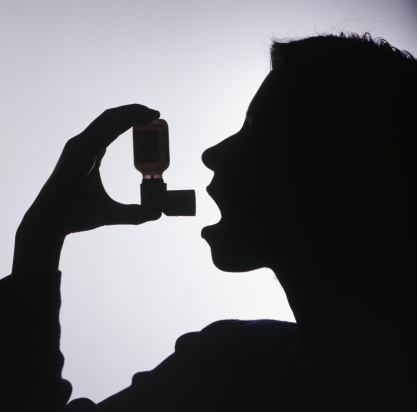 Many patients with AERD/Samter’s Triad require medications to control their asthma symptoms, and often need to use daily inhaled corticosteroids. Intranasal steroid sprays or nasal/sinus steroid irrigation can be helpful to control symptoms of chronic rhinosinusitis and nasal polyps. Nasal polyps can also be treated with intrapolyp steroid injections. Medications that block the production of leukotrienes (zileuton / Zyflo CR) or block the actions of leukotrienes (montelukast / Singulair and zafirlukast / Accolate) have been found to provide some benefit in treating the symptoms of AERD/Samter’s Triad and in decreasing the severity of reactions to aspirin and NSAIDs. The need for surgical removal of nasal polyps is common in AERD/Samter’s Triad, though the rate of recurrence of nasal polyps after surgery is quite high. The addition of montelukast (Singulair) after surgery may slow the rate of recurrence. In people with AERD/Samter’s Triad, aspirin desensitization can be performed by administering gradually increasing doses of aspirin in a hospital or clinic that specializes in such treatment. The dose is slowly increased until the patient is able to take a full dose of aspirin and is then considered desensitized and can continue to take aspirin and other NSAIDs safely. The goal of an aspirin desensitization procedure is to have the patient begin long-term daily aspirin therapy, which can treat the underlying cause of AERD/Samter’s Triad and decrease the need for oral corticosteroid medications and reduce the frequency of sinus surgeries needed. Most patients desensitized to aspirin and treated with aspirin therapy have less nasal congestion, less polyp regrowth, and improved sense of smell and an improvement in their asthma symptoms. Learn more about aspirin desensitization therapy.